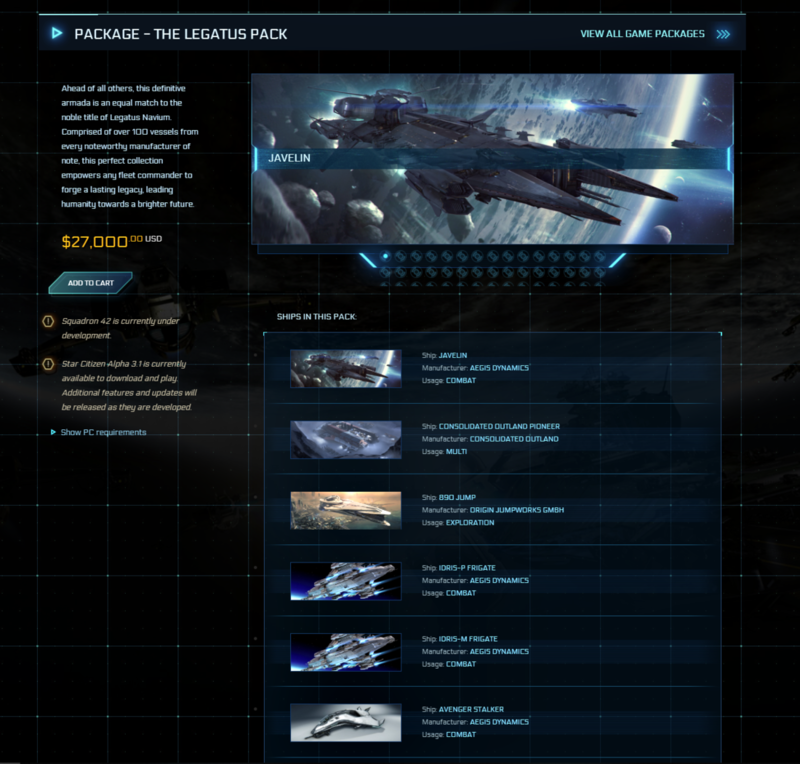 A new Legatus Pack is available for purchase in Star Citizen via the game’s official website. If you’ve just clicked on the link and are wondering why nothing is actually visible, here’s the answer: you’ll need to have already spent $1000 into Star Citizen to become a concierge member to actually view and therefore buy the Legatus Pack. That’s only the tip of the iceberg of your expense, though. The Legatus Pack is being sold at $27,000, making it in all likelihood the most expensive package in the history of videogames or thereabouts. Ahead of all others, the definitive armada is an equal match to the noble title of Legatus Navium. Comprised of over 100 vessels from every noteworthy manufacturer of note, this perfect collection empowers any fleet commander to forge a lasting legacy, leading humanity towards a brighter future. The developers of Star Citizen are still currently engaged in a legal battle with Crytek, the makers of CryEngine. There’s still no release date for Star Citizen or Squadron 42, the single-player focused part of the game. Javelin, Consolidated Outland Pioneer, 890 JUMP, Idris-P Frigate, Idris-M Frigate, Avenger Stalker, Avenger Titan, Avenger Titan Renegade, Avenger Warlock, Eclipse, Gladius, Gladius Valiant, Aegis Hammerhead, Reclaimer, Redeemer, Retaliator Bomber, Aegis Sabre, Sabre Comet, Vanguard Harbinger, Vanguard Hoplite, Vanguard Sentinel, Aegis Vanguard Warden, AEGIS Vulcan, Carrack, Anvil Crucible, Hornet F7C, F7C Hornet Wildfire, F7C-M Super Hornet, F7C-R Hornet Tracker, F7C-S Hornet Ghost, Gladiator, ANVIL Hawk, Anvil Hurricane, Terrapin, Xi’An Khartu-al, Nox, Nox Kue, MPUV Cargo, MPUV Personnel, Defender, Banu Merchantman, Mustang Alpha, Mustang Beta, Mustang Delta, Mustang Gamma, Genesis Starliner, Hercules Starlifter A2, Hercules Starlifter C2, Hercules Starlifter M2, Drake Buccaneer, Caterpillar, Caterpillar Pirate Edition, Cutlass Black, Cutlass Blue, Cutlass Red, Drake Dragonfly Black, Drake Dragonfly Yellowjacket, Herald, Esperia Vanduul Blade, Esperia Vanduul Glaive, Prowler, P-52 Merlin, Kruger P-72 Archimedes, MISC Endeavor, Freelancer, Freelancer DUR, Freelancer MAX, Freelancer MIS, Hull A, Hull B, Hull C, Hull D, Hull E, Prospector, MISC Razor, MISC Razor EX, MISC Razor LX, Reliant Kore – Mini Hauler, Reliant Mako – News Van, Reliant Sen – Researcher, Reliant Tana – Skirmisher, Starfarer, Starfarer Gemini, 100i, 125a, 135c, 300i, 315p Explorer, 325a Fighter, 350r Racer, ORIGIN 600i Exploration Module, ORIGIN 600i Touring Module, 85X, M50, Origin X1, Origin X1 – FORCE, Origin X1 – VELOCITY, Aurora CL, Aurora ES, Aurora LN, Aurora LX, Aurora MR, Constellation Andromeda, Constellation Aquila, Constellation Phoenix, Constellation Phoenix Emerald, Constellation Taurus, RSI Orion, Polaris, RSI Ursa Rover, Tumbril Cyclone, Tumbril Cyclone AA, Tumbril Cyclone RC, Tumbril Cyclone RN, Tumbril Cyclone-TR, Tumbril – Nova Tank, Captured Vanduul Scythe. Origin Rover, F7A Military Hornet Upgrade, Endeavor Bio Dome (2×1), Endeavor Bio Dome (2×1), Endeavor Supercollider (2×2), Endeavor Service Equipment & Crew (2×1), Endeavor Fuel Pod (2×1), Endeavor Landing (2×1), Endeavor Medical Bay (2×2), Endeavor Research Lab (2×1), Endeavor General Science (2×1), Endeavor Telescope Array (2×1), Retaliator Front Cargo Module, Retaliator Rear Cargo Module, Retaliator Front Dropship Module, Retaliator Front Living Module, Retaliator Rear Living Module, VFG Industrial Hangar, UEE Land Claim License Lot Parcel, UEE Land Claim License Estate Parcel, GreyCat Lot Geotack Planetary Beacon, GreyCat Estate Geotack-X Planetary Beacon, Outpost Construction Material, Greycat PTV, Set of 9 Campaign Skins, Electro Skin Hull, Ribbon Fish (Vario Vittas), Thorshu Grey, Menarik, Oshi, Vindel, Midas Fish, Fishtank Mark 1, Origin Racing Suit, Model II Arclight Sidearm, “Be A Hero” Poster, “We Want You” Poster, “350R” Poster, “Cutlass” Poster, “Freelancer” Poster, “Hornet” Poster, “Retaliator” Poster, “Gladiator” Poster, RSI Constellation poster, Murray Cup poster, UEE Environment Coat, E&I M34 Restraint System, FACTION-9 Baton, Hartwell Music Sentinel 88G, Skull and Crossbones Skin, 600i Poster, Takuetsu 600i Model, Takuetsu Origin 890 Jump, 890 JUMP Poster, Anvil Carrack Poster, Takuetsu Carrack model, Takuetsu Cyclone Model, Tumbril Cyclone Poster, Defender Poster, Takuetsu Defender Model, Drake Dragonfly Poster, Takuetsu Dragonfly Model, MISC Endeavor Poster, Takuetsu Endeavor Model, Takuetsu Genesis Starliner Model, Genesis Starliner Poster, AEGIS Hammerhead poster, AEGIS Hammerhead model, Drake Herald Poster, Drake Herald Model, ANVIL Hawk Model, ANVIL Hawk poster, Takuetsu Hull C Model, Hull C Poster, Takuetsu Hurricane Model, Anvil Hurricane Poster, Tumbril Nova Tank Poster, Tumbril Nova Tank Badland Box, Tumbril Nova Tank Badland Model, Tumbril Nova Tank UEE Army Box, Tumbril Nova Tank UEE Army Model, Tumbril Nova Tank Badland Skin, Tumbril Nova Tank Snowblind Skin, Takuetsu Nox Model, Nox Poster, RSI Orion Poster, Takuetsu Orion Model, Consolidated Outland Pioneer Model, Consolidated Outland Pioneer Poster, Takuetsu Polaris Model, Polaris Poster, MISC Prospector Poster, MISC Prospector Model, Prowler Poster, Takuetsu Prowler Model, Aegis Reclaimer Poster, Takuetsu Aegis Reclaimer, Takuetsu Terrapin Model, Terrapin Poster, Vanguard Harbinger Poster, Vanguard Harbinger Model, Vanguard Sentinel Model, Vanguard Sentinel Poster, Takuetsu Hoplite Model, Hoplite Poster, Origin X1 Poster, Origin X1 Model, Origin X1 Scarlet Skin, 85X Poster, Takuetsu 85X Model, Vanduul Blade Model, Vanduul Blade Poster, Drake Buccaneer Poster, Takuetsu Buccaneer Model, Takuetsu Anvil Crucible Model, Anvil Crucible Poster, Takuetsu Eclipse Model, Eclipse Poster, Alternative Eclipse Skin, Eclipse Logo Poster, Gladius Valiant Poster, Takuetsu Gladius Valiant Model, Hull A Poster, Takuetsu Hull A Model, Takuetsu Hull B Model, Hull B Poster, Takuetsu Hull D Model, Hull D Poster, Takuetsu Hull E Model, Hull E Poster, Takuetsu Javelin model, Javelin Poster, Argo Poster, Takuetsu Argo Model, Takuetsu P-72 Archimedes model, P-72 Archimedes Poster, Unique Eclipse Serial Stamp, Razor Poster, Takuetsu Razor Model, Takuetsu mini Retaliator Base, Retaliator Base poster, Takuetsu Aegis Sabre Model, Aegis Sabre Poster, Takuetsu Sabre Comet Model, Sabre Comet Poster, Starfarer Gemini Poster, Takuetsu Starfarer Gemini Model, AEGIS Vulcan Hazard Yellow Skin, AEGIS Vulcan CTR Livery Skin, UWC Service Uniform (Exclusive Early Bird VIP Item), 600i Name Reservation, Hammerhead Serial Stamp, Unique Polaris Serial Stamp, MISC Razor LX Serial Number – CR2018, MISC Razor EX Serial Number – CR2018, Star Citizen Digital Download, Squadron 42 Digital Download, Digital Game Soundtrack, Digital Star Map, Digital Making Of Star Citizen, Digital Engineering Manual, Star Citizen Digital Novella, Starting Money: 20,000 UEC.